Churn. It's the bane of every SaaS company. No single metric creates more anxiety and lost sleep among software founders than their product's churn rate. Both revenue churn and customer churn are hugely important metrics for tracking the overall health of your business, but focusing on one metric while ignoring the other can effectively disguise imminent business problems. To muddy the waters even further, many PMs and founders hold different opinions about how churn should be addressed. Some accept churn as an inevitable cost of doing business, setting “background churn” benchmarks to guide future growth decisions. Others consider all churn to be preventable, working to retain customers even when it may not be cost-effective for the business. Customers are the lifeblood of every SaaS business, and every customer that decides to stop using your product feels a little like a punch to the gut. But the reasons behind customer churn can vary significantly, and the truth is that many of those reasons are outside of your control. And in fact, sometimes churn isn't even a bad thing at all. Not all churn is bad for your business. Every time a customer makes the decision to leave your product, they're making a statement—telling you something about your product, your service, or your brand. Great founders and product managers should be constantly gathering information on how to improve their products and services. Every customer churned is an opportunity to understand how you can create a better product. When your support team breathes a sigh of relief after hearing a particular customer has churned, it's a good sign that the customer was not a great fit for your business. It's easy to assume or that every new customer will be a good fit for your product. After all, they must understand what they're looking for if they signed up, right? But many customers don't fully understand their own needs, which can lead to bad fits absorbing large amounts of support time and energy as they try to adapt the product to fit their very specific needs. The business cost of bringing on too many bad-fit customers will often outweigh the benefits and revenue these customers provide. Disqualifying bad-fit leads early on can lower your overall cost per acquisition while also increasing the average lifetime value across the remaining customers who are a good fit for your product. The flip side of losing a bad-fit customer, of course, is learning more about who your best customers are. By segmenting customers who aren't a great fit, you can begin to understand how much burden each segment adds to your customer-facing teams, slowly building a more accurate profile of your ideal customers. And because you can't be all things to all people, when you have a truly bad fit customer on your hands, the solution is simple: Let them churn. No customer wakes up in the morning and decides to leave your product out of the blue. Instead, the seeds of churn are often sown long before a new customer even signs up for your product. Frequently, customers will sign up knowing that they'll only need your product for a short period of time. For example, they may be working on a client project with a short deadline, and they only need one month to complete the project. These customers essentially make the decision to churn the moment they create an account—they're likely to churn no matter what. This type of churn is a great opportunity to learn more about your customers' needs. If you discover that a large number of customers are churning after only a short time, an exit survey is a great opportunity to find out what their needs truly are and how those might differ from your assumptions. You may learn that a short-term plan, a more extensive product trial, or a simpler version of your product will better meet the needs of those customers. It's easy for companies to juice their top-line metrics by pouring more funds into their marketing and sales channels—but it's an approach that doesn't lead to sustainable business growth. Yes, you will have more customers, but many of them will not be a great fit for your product or have no desire to stick with your product for the long haul. In fact, bringing on more customers can often overwhelm your customer-facing teams, leading to unsatisfied customers and an increase in overall churn—precisely the opposite of what you're trying to achieve. In 2015, Zenefits grew too quickly, hiring employees to support revenue projections that far surpass where we are today. Today’s action aligns our costs more closely to our business realities and gives us the runway we need to build the business properly for the long term. While an increase in churn following rapid growth isn't good, it does tell you that your growth is hurting the other parts of your business, like support and customer success. Bringing in customers at a rapid pace is only worthwhile if you have systems in place to retain those customers at the same rate. Pouring money into acquiring customers at increasing costs might result in short-term gains, but many of those new customers will churn quickly, making the growth unsustainable. Occasionally, you might come across a “roll-up company” that purchases and operates multiple software companies aimed at serving a particular vertical. Those companies frequently manage products with overlapping feature sets, some of which may be seen as competitors from the customers' perspective. 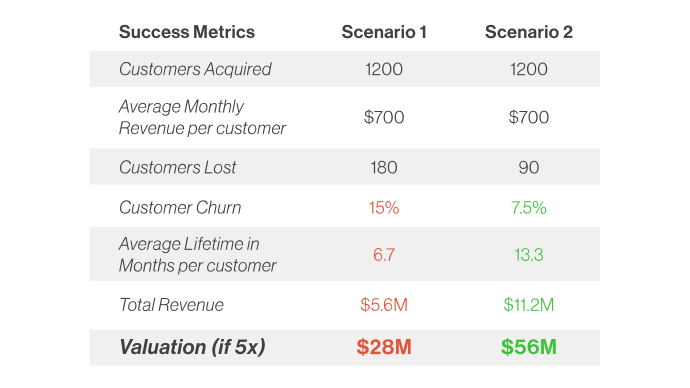 If a customer leaves your product for a competing product—but you also own the competing product—the net loss is zero, making churn a nonissue. 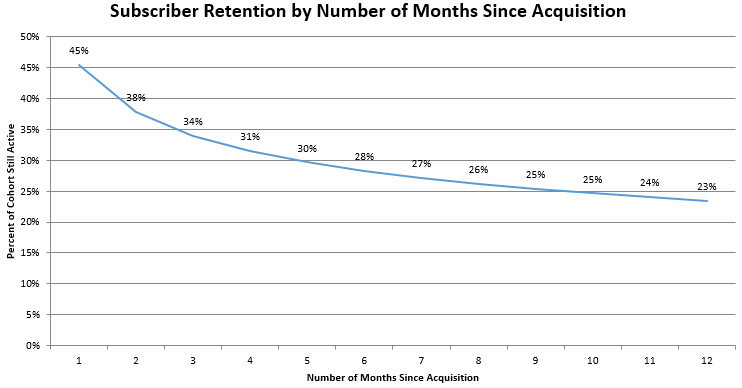 For many SaaS companies, this category of churn tends to be uncommon. If you do happen to experience this type of churn, take it as a great sign that one of your products or brands is stronger than the others—talking with customers can help you understand why and help you discover ways to improve the overall strength of each product in your portfolio. If you're operating in a large, transient market, your customers will naturally come and go over time—that means some background level of churn is unavoidable and should be managed accordingly. This occurs most frequently in B2C companies, since they tend to aim at a much wider customer base. Blue Apron, for example, has a much higher churn rate than what would be considered acceptable for a B2B software company, with some experts estimating that 72% of customers will churn within the first 6 months. While some of that churn could definitely be prevented, much of it occurs naturally as customer needs change—people relocate, they start shopping at the grocery store instead of getting ingredients delivered, their financial situation changes, etc. This kind of churn is much less common in the B2B space. Business needs are much more steady than consumer desires, and companies tend to spend more time making educated purchasing decisions. Exit surveys and customer-focused cancellation flows can provide valuable insight into how much unavoidable churn you should expect and can help you consider other areas of the business, outside of retention, that you could improve. Even in the five scenarios above, too much churn is never a good thing. Subscription-based businesses simply can't survive if churn is too high. So SaaS companies are faced with a dilemma. On the one hand, simply accepting churn as an inevitable part of doing business can cause you to stop searching for ways to mitigate churn, preventing your business from reaching its full potential. On the other hand, trying to eliminate churn entirely can be a massive resource drain for your company. There will always be some level of churn that cannot be prevented. The best path forward, then, is to strike a balance by focusing on slowly improving churn. As bad-fit customers churn out and your product matures, your ratio of good-fit customers should improve, along with your overall churn rate. 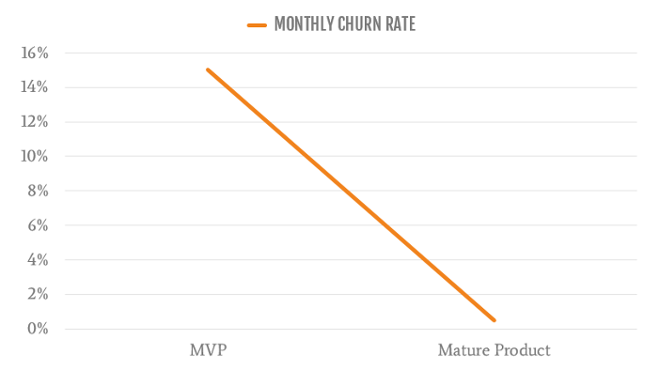 To improve your churn rate, you have to improve your product. The best way to do this is to learn where and why your customers are leaving in the first place. And this is exactly why the churn rate you hate is actually an opportunity, not a burden: It can help you identify moments of frustration within your product—places where your product may not be meeting user needs. Once you've figured out where your product can be better, you start improving your product in the places that actually matter. That isn't just churn prevention—it's part of creating a better user experience. Now stop panicking about your churn rate and get some sleep!